I struggled in choosing how to put together my Poison Ivy costume. I wanted to do something close to the comic, but there is no way I have the confidence to essentially walk around in a bathing suit and tights. I had to have some kind of bottoms - maybe boyshorts, maybe a skirt. I found this Photoshopped image of Emily Blunt as Ivy and fell in love with the corset. I had a place to start. With the help of Twitter, I learned that the corset is available at Frederick's but not in green (damn near every other color though). I quickly searched the net for advice about dyeing polyester, determined it could be done, and bought the corset. I added tights and gloves from a rocking site I just discovered, We Love Colors. 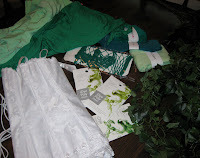 Eventually I scrounged up a suitable green skirt at USA Dance Shoes. Whew. Remaining materials include iDye Poly in green and lots of fake ivy leaves from Michael's. I got really lucky and found the boots for $20 on Etsy in my size. The costume required more work than I thought, yet considering the end result, not so bad. The most time consuming part was dyeing the corset and skirt. I was incredibly happy with the shade of green my corset ended up. I followed the directions on the package and simmered it for about one and a half hours with frequent stirring. I put it right from the pot into the washer on cold and that seemed to set the dye. The skirt required a little modifying. I ripped out a lot of sequins and cut off the bottom half. It was a little too pixie like. Since it was a lighter mint green, I threw that in the same pot of dye after the corset was finished. After everything was close to the same shade of green, I looked at the fake ivy leaves. They returned my stare. I was really hesitant to cover up the corset, it's too pretty. 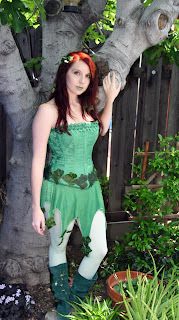 But ivy leaves are important to the costume, otherwise I just looked like a faery. I hot glued a line of ivy leaves up the outside seam of each boot. I selectively placed them on the skirt and along the bottom edge of the corset. I used bobby pins to attach smaller leaves to my hair. Even with these and a touch of green lipstick and eye shadow, a handful of people didn't make the instant Poison Ivy connection. Any suggestions on how I can improve it before the next convention? I think the only solution is to sadly cover the corset with ivy leaves. I think the costume is pretty great. I think the only other solution for being more recognizable is simply to hang out with other Batman characters, find a friend to go as Catwoman or Harley Quinn. Other than that, amazing job, I need to think of a costume for PAX if I'm going. She looks rather a lot like a Pixie too, so I wouldn't worry overmuch about that. I think I'd actually accessorize more with lengths of ivy, maybe wrapped up one leg and around the torso - not completely covering the corset (Great job dyeing, btw!). I think another way to make you more recognizable it might be good to go with more ivy, definitely with the arms and such, or possibly like Ivy bracelets. Possibly a bit more in the hair, it would help it out a bit. I still love your costume it's awesome. 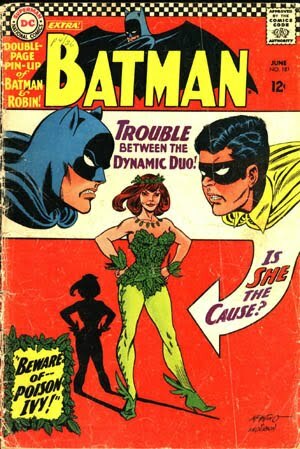 when I get around to my poison ivy costume, I'll totally share my tribulations with you. If you HAVE to cover the corset, do it in a removable way. The easiest thing to do is thread a needle with a very long thread and use ONE STITCH to attach each leaf. That way it's just a few strands to cut when everything is over and you want the corset back to it's original state. I've actually covered this type of corset several times ... and it's none the worse for all the stitches that have been put in and taken out. Plus, it's about as fast as hot glue, and with less precision. I also agree with twining ivy strands around your arms and/or legs. It would all add! Theresa - Yeah, she doesn't have a bit of a fairy look huh? I almost wore a strand of ivy around my arm, but it looked... off. I love the idea of winding one up my leg. And anything not to cover up the corset. It's too pretty. @ally - Ivy does have some leaf gauntlet sort of things, those could help too. And maybe gloves. I just have to find the right shade. I look forward to hearing about your Ivy costume! Sarah - Ahh - see, I knew there had to be a way to attach them other than hot glue. I might put another row of leaves around the top. Or maybe some verticle lines of ivy down the boning. The dye job just came out too nice to cover it entirely. Long green bicep-lenth fingerless gloves. and maybe a venus flytrap or similar faux plant in your hair. Emma lady - thanks for the suggestions. I think the gloves are a must! I thinking of using this idea for a homemade authentic looking tinkerbell costume. How hard is it to dye the corset? It took time, but the corset took the color really well! Curly hair and more leaves in the hair would be all it takes.